This to me is my very best before and after when it comes to a save I made from the farm house. I would give anything to go back and get a good before picture of this beast. Why don’t I have one you ask? Because I’m a bull and I couldn’t wait to strip it so I just threw myself into the job the first chance I got and boom I had forgotten to take a before. Seriously, the before picture should have been taken even before we cleared out the screened in porch because this beast was not even recognizable as a piece of furniture at that point. As just a reminder, here is the before and after of what the screened in porch looked like! Right there on the left (not far from that creepy old chair) was where this oak dresser resided for DECADES. 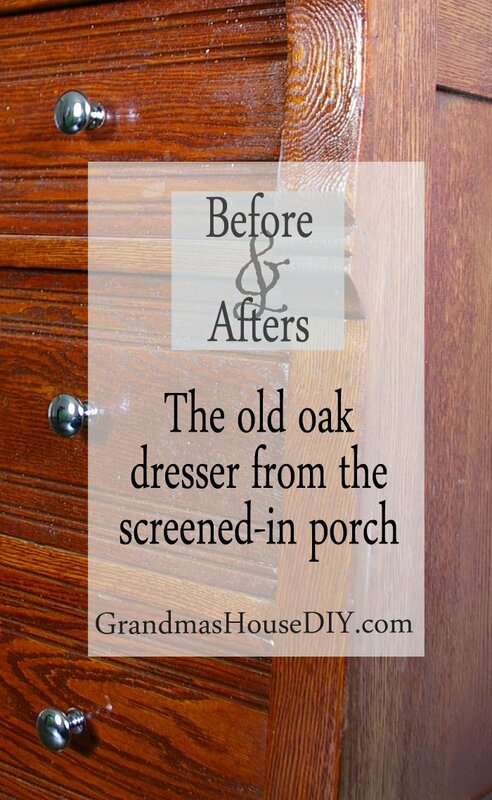 No one knows where this oak dresser came from, nor does anyone know exactly how long it sat out on the screened in porch. Both my mother and aunt would agree that it had been there for as long as they could remember. There is a rather good chance that this oak dresser may have even been in the house when my Grandparents moved in in the ’50s. We just don’t know. What I do know is that before it was moved to the screened in porch to experience all of the degrees of Minnesota weather, it had been painted white and a mirror (not its mirror) had been added to the back of it. (Check out the jewelry hanger I made out of that old mirror’s frame!) It may have had its own mirror once I only know that the mirror that had been added had fallen off at some point and was sitting behind it. The entire thing was so utterly covered in dirt that no one wanted to even touch it. This is the kind of filth that’s hard to explain, dirt that is so old and so dense its like skin. But, I thought, what the hell, what have I got to lose? It wasn’t terribly heavy and, amazingly, the drawers worked and it seemed sturdy. So, I took it home to see what I could do. I started out by hosing this puppy off as I had no intention of touching that second skin of filth any more then I needed to. I mean, seriously, I don’t mind getting dirty but this thing was FILTHY. Underneath the paint was what someone who likes shabby chic would probably have paid a fortune to achieve. It was utterly cracked, jagged, rather amazing actually. (This is when I should have taken the before picture.) It came off in one quick stripping and became what you see in the before picture. Underneath revealed solid oak. With a couple of passes with my sander it looked brand new. I consider this old beast my greatest save/transformation but, amazingly, it was also one of my easiest. It had seen so much weather that it sanded up really quickly and took stain in text book style. At first I had planned this for the third bathroom vanity in the house but it became so dear to my heart that I decided to keep it as a dresser in Dakota’s bedroom. I used this red oak stain by minwax and two coats of minwax polycrylic. The hardware is off of amazon and its an absolutely awesome deal click here to check it out. The knobs are heavy, really high quality and so little in cost compared to other hardware that I’ve seen that you’ll be seeing these pretty little knobs on just about everything in my house! We love how this oak dresser turned out! Wow, what a transformation! Thanks for adding your flair to the Thursday Favorite Things Blog Hop! This post has been pinned to our group board. Marvelous! With the current trend to paint furniture I feared that was what I’d find here, but I’m so glad to see the beautiful finish! It’s just lovely. Wood beauty at its best!! Love how you upcycle that gorgeous dresser! This is gorgeous. I appreciate your courage in tackling such an icky job but you reign supreme. You did a terrific job. I saw your link at the Vintage Charm party. Thank you Ann for stopping by and having a look! What a big undertaking! It turned out lovely! Your hard work really paid off! If you are interested in joining in one more party each week I host Making Broken Beautiful every Thursday thru Sunday and would be happy to host you. You do lovely work! I hope you have a great week! Thank you Terry I will definitely do that!! Your painstaking work on the dresser paid off. Well done! Nothing is more beautiful than restored wood. This chest proves it. Lovely job!! Thanks so much for linking to Friday’s Furniture Fix. We love having you!! What a beautiful job. I love painted furniture but this piece is not meant for that. It looks lovely. Yeah when I saw those stripes on the drawers I got so excited to see it stained! Thank you! Visiting from Lost and Found Decor and saw this AMAZING transformation! I’m not sure I would have seen the beauty in this dresser. Monique, thank you so much! Thank you Christine! I’ll be there! Found you via Sweet Inspirations! What an amazing transformation!!! 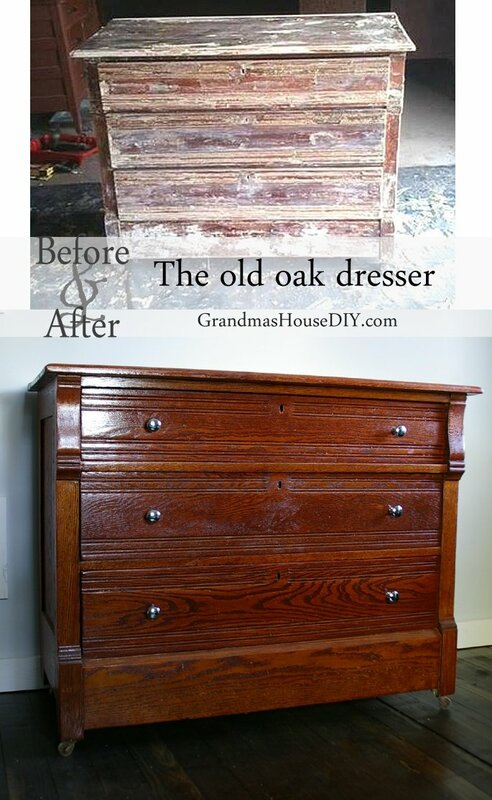 I love that you uncovered the beauty of this dresser and was able to restore it to its wonderful self!! You truly got a treasure in this dresser. Thanks for sharing at Sweet Inspiration! I really love this dresser! Thanks for sharing at Meet up Mondays. I love the transformation. I never paint good old oak furniture and I was a little scared to see if you had done that. Great job on bringing this piece back to life! Thank goodness you didn’t paint it. It came out too beautiful to cover with paint. Great Job! thanks so much for sharing your lovely chest of drawers on Wonderful Wednesday’s Link Party this week. I will be sharing it on next week’s link party as a feature!! Oh that’s awesome!! Thank you so much! What a beautiful end result! Thanks for sharing at You’re Gonna Love it! lol Nikki I think you’re right! My goodness – what a transformation!!!! Looks great and you know it will last forever! It already has! Wonderful job. You have knack for these DIY projects. Thanks Michelle for commenting and stopping by! What an amazing transformation. I love renewing old things. Please join us on Sunday’s Best Linkup, I would love for you to share your posts. I’ll be there, thank you! Tarah, your dresser transformation is beautiful. What’s a little dirt to a girl with a hose, a sander and some mini wax ? How special to have this piece in your home. Thank you for sharing at Your Inspired Design Link Party. 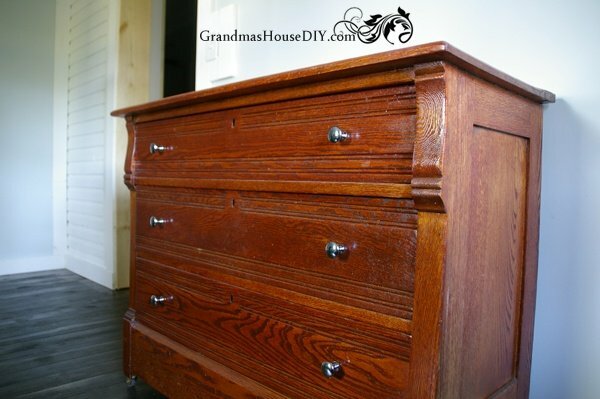 This dresser is absolutely gorgeous1 And now it can be used for generations to come! Great job! Wow, what a transformation. I love the finished product. We don’t always need to paint furniture and it is true in this case. Thank you Bev 🙂 I’m so glad I went to all the work of stripping this one instead of painting it! It is absolutely gorgeous! I am so glad you stained it! You did a beautiful job! Stopping by after seeing your post on “Tutorial Tuesday”! Thanks! Thank you Teri for coming by! I will Jess! Thank you very much! Great rehab on a classic piece! They just don’t make them like that anymore. Good stuff! Ashleigh my gosh thank you so much!! Glad you liked it 🙂 I was so excited when it turned out good lol sometimes you just never know! I think it’s either a generational or a midwest thing to have dressers and old furniture on the porch. One sat on my grandparents back porch right next to the chest freezer for years to store my grandma’s canning supplies. You did a wonderful job at restoring this treasure! Thank you so much for sharing it at the Monday Mish Mash Link Party!! lol so true! Yup my Grandma had a chest freezer out there for years along with this dresser! Thank you! Boy that is a treasure you’ve uncovered!! Thanks for sharing with us at Throwback Thursday! That looks amazing! Well done! I would take an old all wood piece of furniture any day over the things that are now not made of wood. Thank you for sharing at Home Sweet Home! Thank you Sherry, me too!! That looks amazing!! 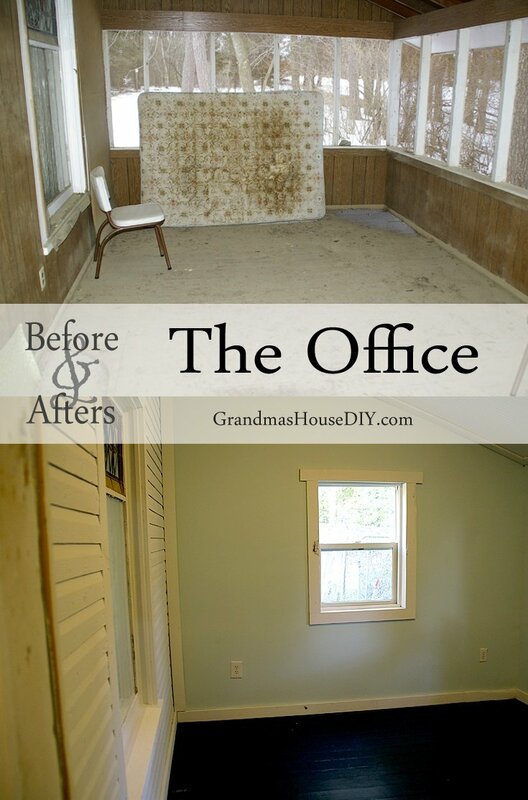 Great DIY and before and after…lol!! Thanks for sharing on My 2 Favorite Things on Thursday! Hope to see you again tomorrow! Pinned! Elaine thank you so much for coming by!! Thanks for sharing! I love a good “before and after”! Tarahlynn, this is such a beautiful piece. You did such a great job saving it! They just don’t make furniture like they use to so when you can bring a piece back to life it begins to hold a special value. You have inspired me so much that I’ve been plundering the local thrift stores in search of something to repurpose as a TV stand as well as something I can repurpose as a unique bathroom cabinet for our bathroom remodel. Thank you so much for sharing your inspiration with us at #SimplifyWednesdays ! Carla, thank you so much for commenting, that’s wonderful to hear! We used an old buffet for our bathroom vanity and we just love it, SOOOO much storage! Good luck on your plundering! Oh, I love taking it back to the dark oak color! I really don’t like to see solid oak painted white. This is beautiful 🙂 Thanks for sharing your post with us at Together on Tuesdays!!! Just lovely! What a wonderful transformation. Nancy, thank you! No, honestly they really just don’t make furniture like they used to! Beautiful! It almost looks like a brand new piece of furniture! What a transformation! This is absolutely gorgeous now! It looks elegant. What a terrific transformation! Pinning. Thanks for sharing at Snickerdoodle Sunday. Amazing transformation! I can’t believe the end result. Thanks for joining the Family Joy Link Party! What a beautiful piece! You did a fabulous job. Thanks for sharing with us. Wow, Tarah! Definitely a labor of love… and the results are stunning. I’m in the midst of painting furniture and distressing but you just showed us how beautiful the older antique furniture really is. Thanks so much for linking up! What a lovely way to remember your Grandmas and what a labour of love! 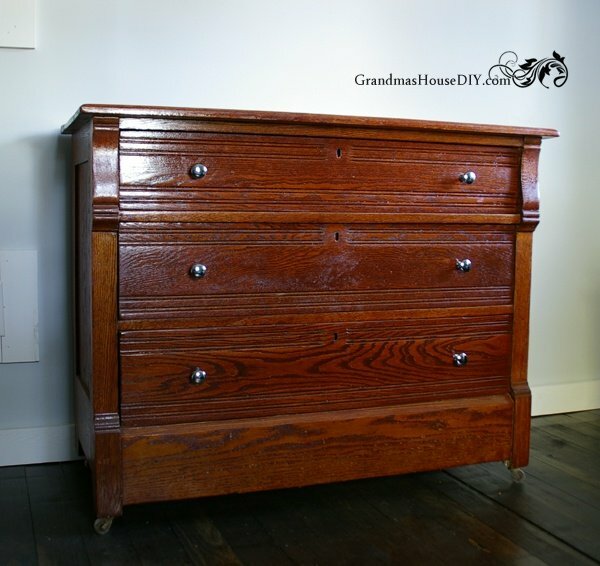 Your have done a beautiful job of this oak dresser – what a transformation!! Thank you for sharing with us at Hearth and Soul. I totally agree! This old dresser was stunning before I started, I couldn’t wait to refinish it and let that wood shine! Oh my goodness…that is absolutely gorgeous! What a treasure! It is such a classic piece I am glad you got it back to it’s former glory ! Thank you Amber, I was really glad to be able to keep and restore this piece! This is a lovely restoration. You can see its beautiful oak with all the grains. Imagine what this piece of furniture is worth in wood cost alone. It is an absolute treasure anyone would love now. Awesome job. Thank you so much Leanna, they really don’t make them like they used to 🙂 I was so glad to be able to restore it! This is so beautiful! I’m glad you were able to make it useful again. It is such a pretty piece. Thanks for sharing at My Busy Beehives #beeparty this week! WOW….Great furniture makeover! Glad I found your website! I’m sooo glad you didn’t slap a coat of paint on it! All too often, I see photos of where someone has just slapped a coat of white paint on what was probably a beautiful piece of wood (at one time) and called it “farmhouse”, or some such thing. It makes me cringe. You put in the work and the time to strip and sand the piece and then apply a stain that gives it color but also lets the beautiful grain of the natural oak to show through. Great job! Thank you so much! When its solid wood like this old piece was I just can’t bear to paint it – just the idea of those gorgeous zebra stripes in the wood grain being covered up makes me cringe so hard! I love all your transformations! That red stain is gorgeous! You have done an amazing job of the office, and the difference in the dresser is phenomenal! I’m so impressed by how beautiful it looks. Thank you so much for sharing with us at Hearth and Soul. Wow, what a treasure you have uncovered. Thank you for sharing at Ravenwould. What. a beautiful transformation! & thank you for linking up to Waste not Wednesday Link party! Thanks Kellie for coming by! Thank you so much for coming by, reading and commenting Sarah! It’s beautiful, you did a wonderful job! Thank you for sharing at The Really Crafty Link Party. Pinned! Hi Tarah, you’ve done an impressive job on that tatty old dresser. It has really come up a treat. I can see why you fell in love with it once you found the diamond in the dirt! The grain is beautiful and the colour, perfect! I love that you can see the diamonds in the rough and that you share the experience with us. Thank you so much for sharing with us at Whisk It Wednesday link party! Pinned and shared! Thank you so much for coming by, reading and commenting and for the great link party!